For all of you who love the great outdoors BackCountry.com, online also at BackCountry.com, is the perfect place for you. BackCountry offers a huge array of gear, apparel, and equipment for you to be able to do all sorts of activities in nature. Find products for all outdoor activities including skiing, snowboarding, snow shoeing, traveling, camping and hiking, climbing, trail running and paddling. You'll find all the accessories and clothing you need by popular brands including North Face, Patagonia, Mountain Hard Wear, Arc' Teryx, and so much more. So check out BackCountry.com and remember to stop by RetailSteal first to find the best BackCountry coupon codes, BackCountry.com promotions, and BackCountry.com discounts. 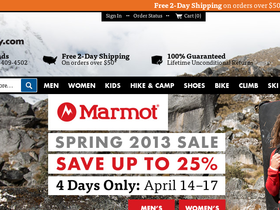 Get free shipping at BackCountry.com on all orders over $50. International shipping is available. Multiple shipping methods can be selected at checkout. See website for full details, exclusions may apply.